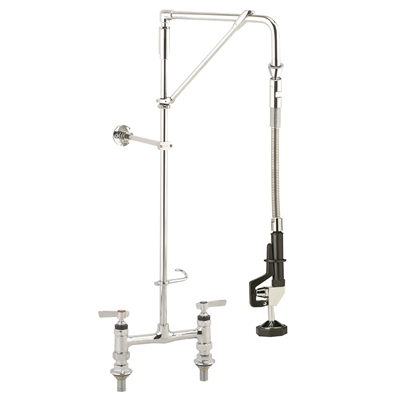 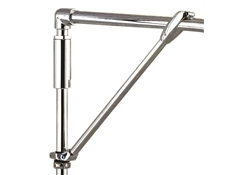 Description: Deck mounted swivel arm Pre-rinse assembly with 8" (200mm) adjustable centres. 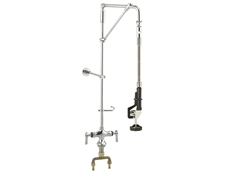 Heavy gauge swivel arm mated to a solid, forged swivel elbow, designed to withstand the demands of commercial operations - Available with 12" (304mm) or 18" (457mm) swing arm offering a full 360o rotation - Furnished with both a conventional pattern spray head as well as exclusive ENCORE water saver spray head - Wall bracket included for fast, secure installation. 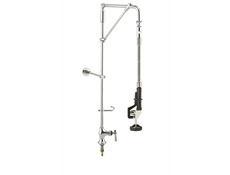 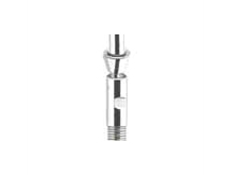 Includes a spray head hook which holds spray head away from work area when not in use - Nylon reinforced hose is protected by heavy gauge, stainless steel shield complete with ENCORE's exclusive strain relief spring, ensuring long product life.